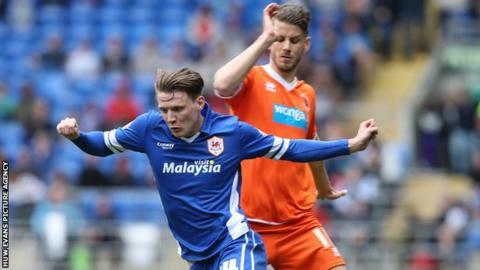 Cardiff City completed their 2014-15 home campaign in the Championship with a 3-2 win over relegated Blackpool wearing their traditional blue. The Bluebirds started the season wearing the controversial red home strip introduced by owner Vincent Tan in the summer of 2011. But Malaysian billionaire Tan switched the club back to blue midway through the season after protests by supporters and advice from his mother. The Bluebirds will finish between 10th and 14th in the Championship - well short of promotion back to the Premier League at the first attempt. And it turns out that this season, statistically speaking at least, they were better in red at home. Cardiff collected 22 points at an average of 1.83 from home matches played in red, but only 13 at 1.18 per game in blue. The quest to return to the Premier League did not get off to a good start. Manager Ole Gunnar Solskjaer left following successive home defeats in September 2014, with Russell Slade appointed as boss a month later. BBC Wales Sport looks at how the club has fared in red at the Cardiff City Stadium, particularly this season.